Help keep your staff stay on top of billing and coding trends and changes with this collection of new resources from HCPro. The revenue cycle in a hospital or health system is a continuum, and each department and role within the cycle has to work in unison to be successful. If there’s a weak link, the entire system can quickly be in trouble due to issues with compliance, reimbursement, and, ultimately, patient care. This handbook will help get everyone, from billers to clinicians, on the same page improving systemic information flow and feedback loops. This toolkit comes with five handbooks that you can give to members of the revenue cycle. 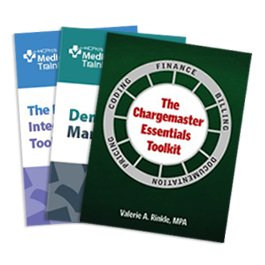 The Chargemaster Essentials Toolkit provides readers with the tools to optimize their chargemaster and use it as a powerful tool for ensuring accurate reimbursement and revenue integrity. Readers will also receive helpful downloadable tools such as a sample maintenance calendar, policies, and questionnaires for working with other departments.